John Pollock's coverage of the NXT TakeOver: Phoenix card featuring Tommaso Ciampa vs. Aleister Black for the NXT title and Ricochet vs. Johnny Gargano. 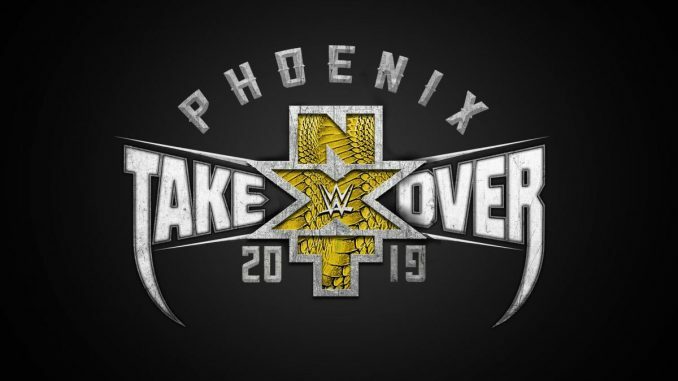 NXT TakeOver: Phoenix is live from the Talking Stick Resort Arena in Arizona. Charly Caruso is hosting the pre-show panel with Sam Roberts and Pat McAfee. They will be handing out the year-end awards throughout the pre-show. TakeOver of the Year was the New Orleans card from WrestleMania weekend. Future Star of NXT was given to Io Shirai. The Breakout Star of the Year award was presented to Ricochet. Match of the Year went to Andrade Cien Almas vs. Johnny Gargano from NXT TakeOver: Philadelphia last January over Royal Rumble weekend. Gargano accepted the award and was confronted by Zelina Vega and ran him down for losing the match and resorting to attacking people in parking lots. Gargano said he would have another match of the year tonight but with the right ending. Male Competitor of the Year went to Tommaso Ciampa. He handed the award back and walked away clutching his title. Female Competitor of the Year was awarded to Kairi Sane, who walked in humming her theme song and was so happy to be the winner. Tag Team of the Year was The Undisputed Era. The Overall Competitor of the Year is Kairi Sane. She gave the most amazing speech and was stunned that she won, this was fantastic. They had a bizarre rant by Sam Roberts running down Bianca Belair as not being at the level the top women of the past in NXT. He ran her down and added nothing to the match other than making the division look subpar when Belair is on an undefeated streak as the panel is supposed to be arguing as though this was real. The main show begins with Mauro Ranallo, Nigel McGuinness and Percy Watson on the call. A procession of Vikings came out for the entrance of the War Raiders. Bobby Fish is in the corner of the champions carrying the plaque they received on the pre-show. The match began with Undisputed Era attacking, Rowe lifted Hanson and scoop slammed him onto O’Reilly and Strong on the floor from the apron. Hanson attempted a dive to the floor and came up empty crashing on the floor. O’Reilly and Strong got the heat on Rowe in their corner. The audience was cheering for Undisputed Era. They cut off the ring with O’Reilly distracting Hanson, so he couldn’t receive the tag. Hanson eventually received the hot tag and was on fire, including a seated senton, a cartwheel into a lariat and the audience was buzzing. There was a huge striking sequence until O’Reilly was pressed into the air and hit with a powerslam by Hanson, who followed with a tope suicida. Hanson hit a top rope splash onto O’Reilly and Strong broke up the cover. The audience was red hot for the next series of near falls with Strong landing a superplex and O’Reilly followed with a flying knee from the top onto Hanson. Hanson kicked out the High-Low combination and responded with a springboard double back elbow to both. Strong was sent to the floor and they hit Fallout onto O’Reilly and won the match. Excellent opening match and Hanson’s athleticism shined throughout the match and brought the audience to the next level. Everyone looked great and each near fall got louder and louder with the crowd at a fever pitch down the stretch. Ohno bailed to the floor and Riddle leaped off the steps with a forearm. Riddle attempted a sunset bomb, which Ohno stopped and covered Riddle’s face with the ring skirt and stomped his head. Riddle ran into an elbow from Ohno, went down and Mauro Ranallo quickly compared it to the end of the Yair Rodriguez vs. Chan Sung Jung fight from last November. Ohno took over and ran Riddle into the post and steps on the floor. Riddle went for a German suplex and Ohno stomped the bare foot of Riddle, but Riddle still landed the bridging German. Ohno grabbed the foot and bit his toes. Ohno hit a Liger bomb for a two-count. Ohno went for a pair of sentons, on the second one Riddle attempted to apply a choke as Ohno got to the rope. Ohno put out his fist and Riddle drilled him with a knee, landed a suplex and attacked with elbow strikes until Ohno tapped due to strikes. I liked the different style of finish with the idea you can end a fight by submission from strikes. The match featured the graphic spots with Riddle’s foot being stomped and bitten but didn’t sell the foot that felt like those spots should have been saved for a match when more could have been done with those spots. A fine match but I wouldn’t say it was great. The early sequences of Gargano attempting maneuvers that were thwarted by Ricochet’s athleticism had the audience chanting right away. Ricochet rotated onto the apron, ran up the turnbuckle and landed a moonsault to the floor onto Gargano. Ricochet landed a springboard uppercut, Northern Lights suplex and rolled into a vertical suplex to Gargano. Ricochet rolled towards Gargano and into a sit-out powerbomb into a crossface and attempted the Gargano Escape, but Ricochet avoided the hold. Gargano was dumped to the floor and hit with a Fosbury Flop. Ricochet blocked a top rope Frankensteiner, Gargano deadlifted to hit it and Ricochet flipped onto his feet as their tribute to Kota Ibushi and Will Ospreay. Ricochet broke out of the Gargano Escape by throwing Gargano into the corner. Ricochet climbed to the top and Gargano rolled to safety, they booed as Gargano went to the floor and Ricochet dove over the post to the floor. Ricochet continued with a springboard 450 splash for a near fall. Then, Ricochet went for a shooting star press and Gargano put his knees up. Gargano’s suicide dive was stopped when Ricochet caught him on the shoulders, but Gargano followed with a reverse huracanrana and then a draping DDT off the rope for a huge near fall. Gargano got upset and removed the padding on the floor, he teased a draping DDT but stopped. Ricochet missed a Phoenix splash and ate a superkick. Ricochet blocked a tilt-a-whirl and applied his own version of the Gargano Escape. They made it back to the floor where Gargano hit a vertical suplex onto the cement and then hit a draping DDT inside the ring to win the title. This match was off the charts. I was surprised they had Gargano win the title but throughout the pre-show, they hit it so hard that Gargano has these great matches and always loses. The streak of excellent TakeOver matches continued with this. On the floor, Baszler yanked Belair by her ponytail and rammed her into the post. Belair was holding her arm as she returned to the ring and became Baszler’s target. Baszler stomped her left elbow. McGuinness cited Pat O’Connor when Baszler utilized a spinning armbar. Baszler took over and was overwhelming Belair, so the announcers referenced the segment on the panel pushing this storyline. Baszler called her “overrated” and Belair slapped her and fought back. She speared Baszler while selling her arm. She didn’t have the bionic powers of Brandi Rhodes for maximum power with the spear. Belair couldn’t keep up with Baszler’s strikes so whipped her with her ponytail to stop her and cut Baszler on her side. Baszler knocked Belair into the referee. Belair hit the K.O.D. and had the match won but the referee was down. Marina Shafir and Jessamyn Duke ran in and Belair fought them off. Baszler applied the Kirifuda clutch, Belair fought the submission and got to her feet and broke out with a vertical suplex, this brought the audience up. Belair took too big of a risk going for a 450 splash off the top and missed. The Kirifuda clutch was re-applied and Belair got to her knees, went back down, Baszler switched arms because she was tired, and Belair got to her feet. Belair went down one final time and went out. They did a well thought out match and it was totally different than the match that preceded them. This was all about showcasing Belair as a credible threat, who got over in losing by fighting off Duke and Shafir and breaking the Kirifuda clutch. I liked the story a lot and it was a very good match. The comparison of this layout would be Georges St-Pierre’s first fight with Matt Hughes, where he fell short but was the future of the division and would avenge the loss to surpass his legacy as the greatest welterweight. Ranallo mentioned Black is 7-0 at TakeOver events. Black landed a tope con giro in the first five minutes. It was a small thing, but Black favored his knee briefly after the dive, which the announcers all picked up on and led to the story of the match with Ciampa going after the knee moments later. Black had the advantage as Ciampa rolled to the floor. Ciampa rammed Black’s left leg into the post and then into the steps. The idea is to eliminate Black Mass. Ciampa yelled that he was a “one trick pony” referring to Black Mass. Ciampa came up with creative ways of attacking the knee. He dropped Black onto the announcer’s desk and then sat cross-legged on the desk taunting Black. Ciampa was seated on top and Black knocked him off with a jumping kick. Everything Ciampa did was aimed at the knee. Black landed a head kick and attacked using the right leg. Black attempted Black Mass and couldn’t do it and Ciampa stopped him. Black attacked and executed a bridging German while placing the injured leg in the air to avoid placing pressure on the knee, this was brilliant stuff. Ciampa caught him on the turnbuckle with a Tower of London onto the edge of the apron. Black hit a flying knee to the back and a brainbuster for a two-count and then a moonsault off the second turnbuckle to the floor. On the floor, Black slipped on some water that Ciampa had dumped earlier in the match. The slip led to Ciampa hitting the Fairy Tale Ending for a near fall. The water was another well thought out spot. Ciampa removed the padding on the floor as everyone just saw Gargano use the same tactic. Ciampa got into the referee’s face on the floor, turned around and Black hit double knees off the apron but landed on his injured left knee. In the ring, Black hit Black Mass with the right leg. He tried to cover Ciampa, who had rolled to his side to avoid being pinned. He went for another and Ciampa used the referee as a shield. Ciampa capitalized and hit a draping DDT off the rope and Fairy Tale Ending for a two-count. Ciampa hit a third Fairy Tale Ending, lifted Black and he stopped Ciampa with a strike, went for Black Mass and his leg gave out. Ciampa hit a fourth Fairy Tale Ending to the prone Black and won the match. I loved this match. The selling by Black was out of this world and he paid such great attention to detail. Even when he fired up and hit a moonsault to the floor, he paid for those high-risk maneuvers because ultimately the knee couldn’t take it. There were so many cool little spots incorporated and the announcers were tremendous and identifying all of them, beginning with Black’s subtle limp after hitting the tope con giro in the first five minutes. Ciampa stood with the title on the stage as Johnny Gargano came out with his North American title and held it up next to Ciampa’s.